The pre-registration survey has closed and teams are being sent event reservations. 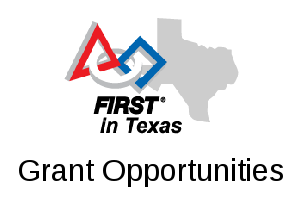 If your team didn’t get into an event that you want you can request to be added to the event’s waitlist using the form at http://roboplex.org/ftc/waitlist-form . Within any of the above groups teams will be given slots first-come-first-served in order of request. 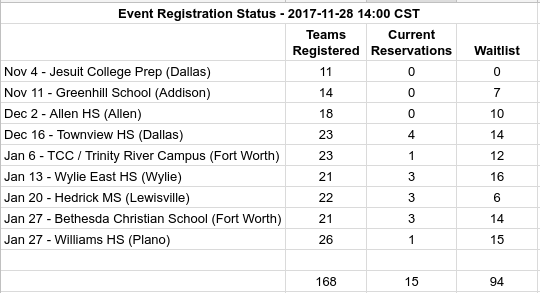 This season North Texas is taking a somewhat different approach to Qualifying Tournament scheduling for FIRST Tech Challenge. Whereas previous seasons have had all qualifiers held in January/February, this season will also have qualifiers available in November and December. This is consistent with what happens in other FTC regions, and also more akin to the scheduling of events in League Play. It also opens up the possibility for some teams to be attending as many as three qualifiers in a season (to provide a more league-like experience for teams unable to join a league). And we’re also changing the event signup process. We started with a “soft” pre-registration phase, where teams can apply to reserve registration slots at the events they wish to compete at. No payment is needed — preregistration simply gives a team priority claim on available registration slots at the event. Then later this month when registration officially opens, teams that participated in the soft registration will be given their selections before other teams can register for the event. The (pre)registration form is now closed — see “waitlist” options above. With more events available they’re also likely to have smaller capacities — we’re trying to avoid large “mega-qualifier marathons” from previous seasons — so (pre)register soon to get a preferred slot before they’re all taken. And don’t write off the earlier events just because you think your team won’t be ready in time — often it’s a good strategy to push a little to compete in an early event, if only to get some early, direct on-field experience in preparation for a later event.